But as always, let’s start with the basics. In effects pedal terms, ”daisy chaining” mostly refers to the practice of powering more than one pedal from a single power source. A daisy chain cable has a start point – usually a female jack where the adapter plugs into – and a number of plugs that go to the pedals. Now, in electrical terms, a ”daisy chain” is a series of connections, one feeding into another. And the daisy chain cable sure looks like a series of connectors. But actually, all the connectors are wired in parallel. One could describe it as being a long series of plugs, which are electrically wired in parallel. 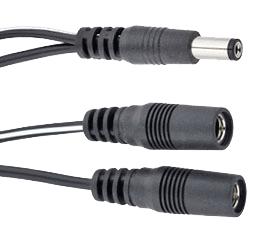 This is another cable that can come into play here, closely related to the daisy chain cable. Again, the plugs are wired in parallel, but this time it is a little more obvious, since there’s two cables coming out from the same plug. The picture shows the ”Split Flex” cable from Cioks (whose cables are easy to identify, since they use RCA/phono plugs at the power supply end), and you can almost see from the outside that it is wired in parallel. Electrically speaking, this is the same as the daisy chain type cable. But there’s no rule that is without exceptions… Voodoo Lab leave the negative wire to the 2nd pedal unconnected in their splitter cables. The theory is that it cuts down on possible ground loop hum – since the two pedals’ grounds are connected through the signal cables anyway, this splitter will not create a second ground path between the two pedals. I must say that I haven’t noticed any difference over the other (fully wired) splitters I have. But that doesn’t mean that there couldn’t be instances where it’d be beneficial, so YMMV. But if you use them, keep in mind that you need to have signal cables connected as well, for the 2nd pedal to work. So, what about those top tips? The first rule is: there are no rules. What works in one rig may not in another, so you need to experiment to find combinations that work without additional noise. Low (and as similar as possible) current draw is best – if the current draw differs too much, the higher current draw pedal can start to starve the smaller draw pedal, which can result in anything from hum to the starved pedal browning out (as if the battery was about to give up). Try to match the signal flow – if the pedals you pair up sit next to each other in the chain, the cable length between the pedals will be similar on both the signal and power sides, which helps keep noise at bay. Leave some room in the power supply – it’s easy to do the math and think that it’s fine running pedals with a total of 90mA off a 100mA output. However, it is always better to leave 30% capacity as a margin. That way, the voltage regulator in the power supply doesn’t have to constantly work at full capacity. And yes, wah pedals are often best left on their own (a regular Crybaby style circuit draws less than 1mA, and will be happiest with its own battery). It’s the imbalance thing again – I have seen instances where a 30mA pedal has completely starved a Crybaby (drawing 0.5mA), even though their combined total was way less than the capacity of that output. Tuner pedals can be tricky – they are often viewed as prime candidates for chaining (not least because some of them have power outputs built in that does this for you). But the noise generated in the power by the LED’s can lead to strange buzzing noises when tuning. So be prepared to stick it on its own output, if that happens to you.